"Many a boogeyman has spooked citrus growers over the years," says John Taylor, coastal agronomic service representative for Syngenta. "But citrus greening and its impact on the industry isn’t folklore. It has the potential to put people out of business." Citrus greening, or Huanglongbing (HLB), is a systemic bacterial disease that has ravaged the citrus industries in India, China and Southeast Asia for decades. Currently, there is no cure, and citrus trees that contract the disease die in as little as five years. With symptoms that initially look very similar to nutrient deficiencies, HLB often goes undetected. By the time it is properly diagnosed, the disease has often spread to many of the surrounding trees. For U.S. growers, HLB is threatening the heart of citrus production, including Florida, Texas and, most recently, California. Because the disease has inflicted significant damage in the Florida market with 2012 yield losses hovering around 15 percent, growers in Texas and California are on high alert. When it comes to fighting HLB, growers face some unique challenges. For starters, HLB-infected citrus trees do not show symptoms during the first year of infection, so there is a long period of time when a grower cannot visually detect an infected tree—but the tree is still a source of bacteria that can spread to other trees via the Asian citrus psyllid (Diaphorina citri). Once symptoms begin to manifest, they can resemble common nutrient deficiencies. Leaf yellowing, misshapen fruit that do not ripen, premature fruit drop and root dieback are all symptoms of HLB, which is caused by the bacterium Candidatus Liberibacter L. asiaticus. The bacterial infection impedes the tree’s vascular system and inhibits the movement of nutrients. Interestingly, these menacing bacteria need help to spread. "The bacterium can live and persist in a plant. But until it comes in contact with a vector, nothing really happens," says Jim Graham, Ph.D., professor of soil microbiology at the University of Florida Citrus Research and Education Center in Lake Alfred. "Unfortunately, that can create a period when many people do not realize the disease is on their doorstep." However, when a vector, such as the Asian citrus psyllid, interacts with the HLB-causing bacteria, their union can quickly cause a major epidemic in the citrus industry. The reproductive and feeding habits of the psyllid make it the perfect carrier of the bacterium. An infected or "hot" psyllid creates a localized infection when it feeds and transmits the bacterium into a citrus tree. It does not take long for the bacterium to spread throughout the plant, but the inoculum is first concentrated in the leaves and stems where the infected psyllid feeds. Female psyllids lay eggs in the same region where they feed. If these females are infected, their nymphs, which begin feeding in the infected area of the tree when they hatch, eventually acquire the bacterium, molt to the winged adult stage and disperse taking it along with them. Once infected, psyllids are disease carriers for the rest of their lives. They can travel miles under their own power, by air currents or as hitchhikers on harvested fruit. Controlling psyllids has become one of the primary strategies to prevent the spread of HLB. For now, there is no cure for HLB, and no resistant citrus varieties are available. Management is difficult, but certain strategies can slow the spread of the disease. These include planting disease-free nursery stock, removing infected trees, managing psyllids and promoting root health. To make sure growers begin with HLB-free citrus trees, Florida has established a production model where all citrus seedlings must be produced in enclosed greenhouses. The overall U.S. citrus nursery industry is moving in that direction as well. Identifying and removing infected trees are big challenges. In Florida, the disease was so widespread by the time it was detected, eradication was impractical. In California and Texas, researchers are pursuing more efficient ways to detect the disease in trees not yet exhibiting symptoms and are hoping early awareness of HLB will prevent the rapid advancement of the disease that Florida has faced. Neonicotinoid insecticides are one option for psyllid management. Growers and applicators can make neonicotinoid applications to the soil and as a foliar spray to suppress psyllids. But, as Elizabeth Grafton-Cardwell, Ph.D., entomologist and director of the Lindcove Research and Extension Center for the University of California, Riverside, points out, "The real beauty of neonicotinoids is that they are anti-feedants, so psyllids don’t want to feed on trees treated with them." This is an important factor in preventing HLB spread, because the psyllid needs to feed to pick up the bacteria. Taylor recommends that Florida citrus growers soil-apply neonicotinoids every six weeks and in between make foliar applications of insecticides with different modes of action. Thiamethoxam, the active ingredient in Platinum® 75 SG insecticide, is a neonicotinoid with good solubility that allows for faster uptake by trees, which makes it a good choice during those times of year that are a little dry or when trees are less active. Optimizing root health may also play a role. After initial transmission in the shoots, the HLB pathogen infects roots, where it extensively colonizes. This infection causes rapid fibrous root loss of 27 percent to 40 percent before symptoms in the canopy appear. Studies show that roots infected with Phytophthora ssp. may interact with the root bacterial infection to further damage roots. To delay crop decline from this dual root disease threat, growers can implement a root health treatment program with Ridomil Gold® SL fungicide. Ridomil Gold has direct fungicidal activity against the Phytophthora root rot disease. Roots rapidly absorb the fungicide, which is then translocated throughout the root system, promoting root health and crop development. One of the best weapons the citrus industry has against HLB is open communication. Growers and researchers who have experienced the disease are willing to share advice about what works and what does not. "We’re fortunate in this industry to have so many educational opportunities and ways of getting information on HLB," says Joby Sherrod, research & development/ technical services manager for A. Duda & Sons, Inc. "My advice? Be proactive. Do everything you can to detect HLB as early as possible and remove the infected trees, if feasible, all while managing the psyllid down to the lowest population levels possible." Citrus greening, or Huanglongbing (HLB), has impacted Brazilian citrus since 2004 when researchers first detected the disease in the southeastern part of the country. Marcos Pozzan, stewardship manager and citrus specialist in Brazil for Syngenta, has partnered with local experts and growers to help develop the country’s HLB management strategy. "We work with three pillars, none more important than the other: Produce healthy trees, manage the vector, and eliminate the inoculum source or the infected trees as soon as possible," he says. The U.S. citrus industry now uses much of this strategy. For example, Florida adopted Brazil’s greenhouse production infrastructure to ensure seedlings planted into citrus groves are HLB-free. Soil drenches and foliar applications of neonicotinoid insecticides play a key role in managing psyllids in both Brazil and the U.S. The large size of Brazilian citrus farms led to the implementation of area-wide management strategies, with some encouraging results. 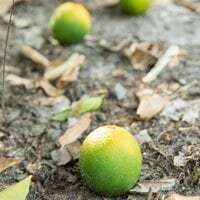 Jim Graham, Ph.D., professor of soil microbiology at the University of Florida Citrus Research and Education Center, describes a success story of a 14,000-acre Brazilian citrus farm that identified and removed infected trees. The farm treated its citrus, as well as the citrus of neighboring farms within two kilometers of its borders, for psyllids. Within one year, the farm cut its HLB incidence from 10 percent per year to less than 2 percent. This example and others like it are encouraging to such areas as California, where HLB has made only an isolated appearance—and Florida, where the disease has made a greater impact. Still, Graham recommends caution. "Brazil has had Asian citrus psyllids since the 1940s, but it wasn’t until a few years ago the bacterium was introduced and caused an epidemic," he says. "That shows how quickly it can happen—something worth remembering in citrus-producing areas of the U.S. not yet facing this epidemic." As active ingredients and traits mature, patent expiration is an eventual stage in the lifecycles of most agricultural brands.